We all think we know the classic Nike marketing strategy. “Just do it” comes to mind pretty quickly, as do Air Jordan sneakers, famous athlete endorsements, and the swoosh logo. But is that really all there is to what Nike is doing? Or, is there something deeper behind their strategy and tactics? The Nike marketing strategy that most of us recognize isn’t the one that made them famous, at least not in the early days. Discovering the Nike marketing strategy that put them on the map is where the gold is. Furthermore, just like any true content marketing strategy, it isn’t really much of a “strategy” at all. Like many similar success stories, it was as simple as providing real customer value. Bill Bowerman was a track and field coach, as well as one of the co-founders of Nike. In the mid-1970's, he began experimenting with his wife's waffle maker to design a better tread for running shoes. As the story goes, he ruined the waffle maker but invented a brand new type of shoe. Get Organized And Save Time With This Free Course! Work efficiently, stay organized, publish compelling content, and schedule everything for maximum growth. Sign up now for this comprehensive marketing course. 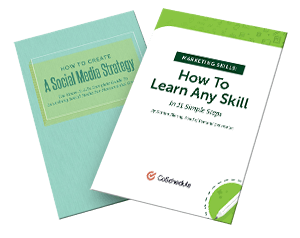 At the end of the course, you'll have a well-thought-out marketing strategy of your own. Time's limited! He later used that design to create the first Nike shoe commonly referred to as the "Nike Moon shoe." It was the first step of many that put Nike on the map, but there is more to the story than just a great tread—wear design and a waffle maker. There's also the story of Nike's incredible, if not accidental and seemingly counterintuitive, approach to promoting their product. Bowerman, you see, is also credited as the man who brought about the jogging craze that swept America in the late 1960's and 70's. While you would think that jogging wasn’t something that needed to be invented, it wasn’t all that popular as an exercise or activity at that time. Bill’s work and research truly brought jogging out of obscurity and to the forefront of the minds of the public. After observing a jogging club in New Zealand, Bill began to understand the value of jogging as a traditional fitness routine. Bill immediately began writing articles and books about jogging and how it could be used as part of a fitness program. His first three-page pamphlet was called the Jogger’s Manual and was later expanded into a 90-page book (see below) that he wrote along with an experienced cardiologist. Jogging, the accidental content marketing showpiece by Nike founder Bill Bowerman. Along with Bill's other involvements with professional athletes, his work helped inspire the 1970's running boom that Nike clearly benefitted from. Was this the result of a strong marketing strategy? Or was it just a coincidence? The answer is probably a mix of both. It would be really great to point to Bowerman's story as a case-in-point example of content marketing at its finest, but it is difficult to do. The book was technically released before the first pair of shoes, and even before he invented the waffle tread. So, if it wasn't true content marketing, what was it and how did it even work? Customers like great products and they like serious benefits. For them, things that benefit them personally are easy to justify. The Nike Moon shoes did this, but only because the customer was beginning to understand jogging and its benefits for their health. Bill's secret goal wasn't to sell shoes, he was simply promoting something that he believed in. This may not sound like marketing strategy, but it certainly should. Initially for Nike's audience, the felt need wasn't for better running shoes, but for a better way to get in shape. Certainly, running was already popular among kids and athletes in the 1970's, but it wasn't the widespread social activity that we see it as today. The growing white-collar workforce helped pave the way for social activities that included the promotion of cardiovascular health. Once the trend was ingrained, the need shifted and the "jogging shoes" themselves became the felt need. It's unlikely that Bowerman's original goal was to become a millionaire as he penned the pages of his first jogging pamphlet. That wasn't why he did what he did. His only goal was to promote a sport and an idea that he believed in. As marketers, shouldn't we believe in the product and the ideas we are selling? For Bowerman, it sure made marketing a lot easier. He was "marketing" without even realizing what he was up to. While jogging is pretty easy to understand, the waffle tread isn't (at least not until you understand why Bowerman made it in the first place). His goal was to make the world's most light–weight running shoe. He believed that this factor alone could dramatically improve the speed of a distance runner. His product worked and quickly gained the industry respect that it deserved. As the marketing landscape has changed since the 70s, so has the Nike marketing strategy. In fact, it’s remarkable how well the brand has adapted its approach to new trends and technologies without losing the core of their identity or brand voice. It’s key to understand that while their general aesthetic and tactics have changed with the times, their customer–centric messaging has remained consistent. While Nike's early marketing strategy centered on print publications, they later went on to dominate other mediums, like television in the 80s and 90s, through modern social media platforms today. Nike hasn’t historically adopted new communication platforms for their marketing just because they’re chasing new, flashy objects. Far from it. Rather, they’ve been quick to conquer new mediums because they’re where their customers are. For example, take a look at their Instagram profile. They know their core demographic includes heavy Instagram users and so it makes sense for their brand to maintain a presence there. However, they also make sure that everything they post provides value. Rather than interrupting the flow of their follower’s feeds with flagrant sales pitches, they share motivational messaging. Other posts, like this one, subtly tie into the brand’s history while directing users to interest–specific Nike sub-accounts on Instagram. In this case, they could have simply said something to the effect of, “Check out our women’s footwear and apparel profile, and our general running product profile." Instead, they went the extra mile and created something memorable and entertaining while staying relevant to what their audience wants to see. How to run your Fastest Mile: Step 1: Wake up hungry. Step 2: @nikewomen Step 3: @nikerunning Stay up to speed at nike.com/findyourfast. For Nike, that has certainly remained true. Throughout their current content marketing initiatives, Nike makes sure their brand message hasn’t gotten lost over time or across channels. They focus their emphasis on creating content that promotes the benefits of their products, rather than the features. Helping their customers be better at what they love to do is still the focus of their branding and message. By moving their content marketing to the platforms where their customers are it shows that they are keeping their audience’s needs in mind while staying true to themselves. Nike's marketing strategy has succeeded in sustaining a global brand while many of their competitors have come and gone from the spotlight. The history of Nike’s marketing strategy is interesting in itself. What you probably want to know at this point is how to apply these lessons to your own work. Your audience is on the Internet because they’re looking for answers to questions. One way to position your brand or blog as an authority on your topic or market is to create compelling content that addresses those concerns. Doing this well means understanding exactly what your audience’s goals are and what they want to know, and then being there to answer and give solutions when they need them. Do this well enough, and you might even turn readers into passionate brand advocates. In Nike’s case, people were looking for new ways to stay in shape. As jogging became more popular, people needed jogging shoes. Nike then smartly positioned themselves not just as a company that made shoes, but a company that helped their customers achieve their fitness goals (and just happened to make shoes that supported that goal). If you’re unsure what your audience is really looking for, try putting yourself in their shoes for a moment (no pun intended) and think beyond the scope of your product or service. Instead of thinking about your product’s features or competitive advantages, think about what goal your customer is trying to achieve. Then, be there with the information, products, and services they need to make it happen. What goal is your customer trying to achieve? Now make content, gather information, and create products that will help your customers achieve their goals. In terms of your blog and overall digital marketing efforts, this means that you need to figure out where your audience hangs out on the Web and how you can best reach them there. Which social networks are they most active on? Should you pay to promote your content on those networks? Does an email newsletter make sense for your customers? Could print collateral be something they’re interested in? These are big questions to answer, but the key point to remember is that its important to go where your audience is. Before considering any content distribution tactic, think about your customer’s habits, what types of content they prefer, and where they prefer to find it. Make sure you're thorough in your approach when it comes to doing everything you can to spread your content. After all, if you're going to try to market like Nike, then you can't afford to settle for the status quo. Whether it’s on your blog, social media channels, video platforms, or print collateral, every piece of content you create should address customer needs. Not only that, but you need to be creating the best content on your topic anywhere on the Web. If you’re not answering questions, solving problems, being entertaining, or otherwise helping your audience be better at doing what they love, then it’s time to rethink your approach. If you’re unsure of what your customer’s real needs are, consider everything from simple keyword research to surveys to get a better idea of what kind of content you can create that they’ll find valuable. You'll also want to consider what content creation budget and resources you have available. If this all seems like a lot of information to take in, that's because it is. If there's just one thing you remember from this post, however, it's the idea of creating content that spreads, instead of content that just sells. Here's the cool thing: Bill didn't sell shoes; he didn't need to. Instead, he sold jogging and all of the benefits that came with it. This should make us pause as marketers. Instead of selling our products we should be selling the benefits that products like ours promote. Running shoes matter to people who jog, so selling them on jogging is always a good first step. The same goes for us here at CoSchedule. We are a content marketing and planning tool. The more people that use content to market their business, the more copies of our software we sell. We also gain the added benefit of understanding why our customers buy what we are selling in the first place. Even in the world of content marketing, there is a lot of selling. This is fine, but it misses the real point that Bowerman so aptly understood–spread ideas, not products. Content marketing is growing, and that usually brings fuzzy definitions that blur the lines between what something actually is and what it is becoming. It's often pegged as a process rather than a technique, but content marketing doesn't depend on a specific set of tools or a common workflow. It is about providing value and building trust with customers. Bowerman's book built trust and provided immense value–a trait that naturally carried over to his products. 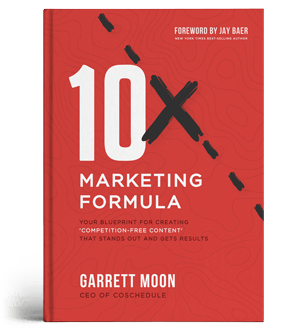 He didn't intend for the book to be used as content marketing, but because, with content, the lines between value and marketing are so blurry, marketing is exactly what he did. Strategy is great. Using keywords is smart. Blogging is the future. But providing customers value, no matter the medium, will never go out of style.